So often it seems the guys in our lives are the most difficult people on our shopping lists. I love to spoil my man, my dad, my sons, but I always seem to fall back on the same gifts. With these gift ideas for guys I’m hoping to change that. 1. Have a sports fan in your life? How about one of these team hats? 2. For the guy that loves to document his adventures, this Instant Digital Camera that prints photos on the spot is bound to generate some excitement. It’s the twenty-first century polaroid, but less bulky and way better looking. 3. + 7. Does you guy have a hero? Maybe an athlete or an astronaut? Rock star or historical figure? A great book on the subject, even a biography or memoir might be just the thing. 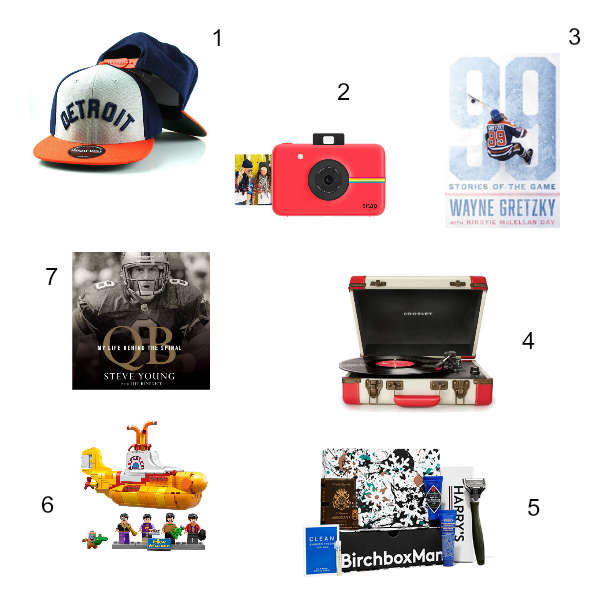 Wayne Gretzky, Steve Young, Bruce Springsteen are all featured it top sellers right now. 4. How cool is this old school turntable? It plays all the vinyl from decades past, but with tons of modern features and technology. I know my dad has some totally groovy old 33s and 45s that would love a new lease on life with one of these. 5. Did you know Birchbox does monthly subscription boxes for men? All the best men’s grooming products and supplies sent right to his door every month. It’s the good stuff he probably loves but never splurges on or won’t admit he loves. It’s a very thoughtful, personal gift. 6. Have you seen these? I don’t know many guys that don’t love Legos, even as grown ups. This Yellow Submarine set features John, Paul, Ringo, George and the titular submarine. Beatles fans plus legos fans, match made in heaven. 7. Wrap up a nod to his favorite sports team with serious retro-awesome style. These throwback caps are perfect. Not an obnoxious one in the bunch, and that Red Sox one might have to land under our Christmas tree for a certain fella I know.